with worlds leading simple and free eMail Group service. Experience the ease and fun of using eMailgroups with your friends, team, class, club or colleagues. Learn more. 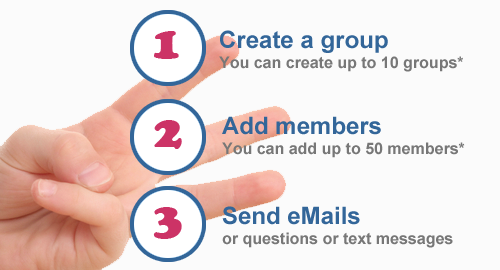 * With a Premium Account you can add more groups and members. More than 395 thousand persons use eMailDodo to send eMails to their groups. They have sent over 32 million eMails in 2018.